Those who will look up the etymology of roil and rile will have to choose between two answers: “from Old French” or “of uncertain origin.” Judging by my rather extensive and constantly growing database, roil and rile have attracted little attention, though Professor Bernhard Diensberg (Bonn) wrote a book on the fortunes of the diphthongs oi and ui in Middle English (it appeared in 1985) and devoted an informative section to those words. Non-specialists may wonder how anyone can write a book on such a subject. “No problem,” as waiters (servers) say in my area when I thank them. English words with oi continue to rile etymologists by their stubborn refusal to disclose their origin. Just try to investigate the history of foist, hoist, ploy, or hoity-toity, and you’ll never get out of this morass. One of the difficulties that plague the inquisitive mind is that oi and i constantly play leapfrog. Dictionaries (or perhaps your own experience) will tell you that a doublet of hoity–toity is hightly-tighty, that joist is related to gist, that many people pronounce point and oil as pint and ile, and so it goes. And it is not for nothing that Crocodile Dundee had a “knoife,” while in the speech of many Britishers the number preceding ten is noin. Returning to our subject, one cannot be sure whether rile and roil are different words or variants of the same verb. The prevailing opinion is that rile is indeed a dialectal variant of roil, and most dictionaries say: rile—see roil. In any case, be it roil or rile, its country of origin seems to have been France. The cautious statement “origin uncertain/unknown” usually refers not to the homeland of the English verb but to its putative French source (etymon). However, Skeat, who always indicated where each word originated, put a question mark and wrote (? F.). I think the first reasonable French etymology of roil goes back to Francis Henry Stratmann, the author of an important Middle English dictionary. Roil1 surfaced in the fourteenth century and meant “roam about.” Then there is a long chronological gap (and such gaps never augur well for etymological studies) until the end of the eighteenth century. Besides that, there is roil2-3 “make turbid,” “vex.” Roil1 partly merged in its meanings with roll, and the other roil (it is not clear whether we have one item or two) merged with rile, whose recorded history begins in 1724. The first edition of the OED was not sure whether all those verbs were related and cited obsolete French ruiler “to mix mortar,” a sense rather remote from what one would expect. But in 1918 Ernest Weekley observed that ruiler looks like a continuation of Old French rouiller, whose derivative rouil “mud” has been attested and fits the required meaning. The online edition of the OED does not object to Weekley’s etymology but offers a more cautious formulation. The sound complex rag is notorious for its etymological obscurity: compare Engl. rag “to scold, rate,” a close synonym of rail. And of course, “scold; disturb; vex” look like related senses. Ragamuffin was once the name of a petty devil, perhaps originally a creature that made a lot of noise, but this is guesswork. Those interested in the origin of Engl. rogue and ragman (as in ragman’s roll, the etymon of rigmarole, the latter being pronounced by everybody I know as rigamarole) will find some information in my post “Old slang: rogue” (12 May 2010). Swedish hippies were called raggare (the word is still very much alive in Sweden), while in the Old Germanic languages the root rag– alternated with arg– and was a gross insult. Thus, when one sees Latin ragere, one cannot help thinking of all those Germanic words. In any case, I believe that this guess has potential. It might be useful to remember that one of several verbs listed under rail means “rattle,” and one of the verbs listed at roil means “to flow”; “to flow” occasionally also means “to make a lot of noise,” with reference to “roiling waters” (there are good examples in Middle High German and Old Icelandic). We have roil “wander,” “flow,” “rattle,” “stir up,” and “vex,” alongside rail “use abusive language.” In the rile ~ roil group, only roll has a clearly ascertainable origin. When the rest of the “family” appeared in English, its members were probably influenced, at least to a certain degree, by the similar-sounding verb roll and began to interact with it and one another. That is why it is so hard to disentangle them and decide which sense belong to which verb and how many senses each of them has. This situation reminds me of the problem I encountered while researching the origin of troll ~ droll, trill, and trawl. Nice Romance etymons have also been given for all of them, but the group is probably sound imitative (see the post “Between troll and trollop,” 3 January 2007). Words tend to tie themselves up in knots. Following the established format, dictionaries devote a special entry to each of them, but it might be more profitable to follow the practice of old lexicographers and feature both individual words and, when expedient, whole nests. Perhaps roll ~ rile ~ roil ~ rail is a good candidate for such a nest. 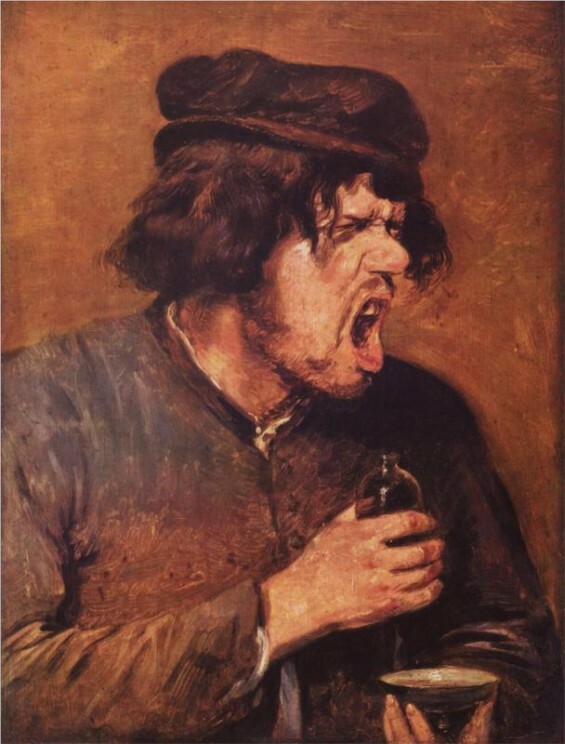 Image credit: (1) The Bitter Drunk by Adriaen Brouwer. Public domain via Wikimedia Commons. 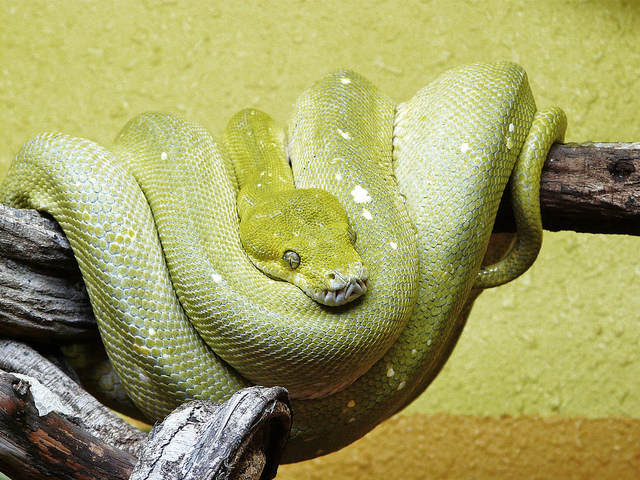 (2) Python vert /Morelia Viridis. Photo by marie. CC BY-NC-SA 2.0 via raym5 Flickr.